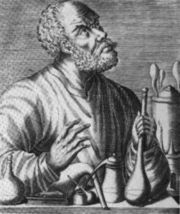 Jabir ibn Hayyan (c. eighth and early ninth centuries) was an Islamic thinker from the early medieval period to whom is ascribed authorship of a large number of alchemical, practical, and philosophical works. Many of these works were translated and distributed throughout the learning centers of medieval Europe under the latinized form of Jabir's name, Geber. Whether or not he was genuinely the author of all the works attributed to him, his contributions were substantial, laying the foundations of modern chemistry. Twentieth century scholar E.J. Holmyard attempts to piece together a life of Jabir from a variety of early sources and a knowledge of the history of the times. According to Holmyard, Jabir Ibn Hayyan was born in 721 or 722, in the town of Tus, in Khorasan, not far from the city of Meshed in modern Iran. His father, Hayyan, was of the Al-Azd tribe, originally of south Arabia, some members of which had resettled in Kufa. Hayyan became enmeshed in the political intrigues of his time, and was executed shortly after Jabir's birth. Jabir's family fled to Arabia, where Jabir studied under the scholar Harbi al-Himyari. In later years, he became the disciple of Jafar al-Sadiq, a shi'ite imman connected with the Abbasids, who, under the caliphate of Harun al-Rashid, later assumed power in the region. Because his father had died supporting the Abbasids, Jabir was able to form a close association with the Barmecides, who acted as the caliph's ministers. He was thus able to practice medicine under the protection of the caliphate. In one of his works, Jabir relates that he cured a handmaid belonging to the household of Yahya ibn Khalid, a Barmecide, by administering a specially prepared potion. For the caliph himself, Jabir wrote an alchemical work, The Book of the Blossom, which included information on experimental techniques. He also is said to have facilitated the acquisition of copies of Greek and Latin authors for translation into Arabic. Jabir kept a working laboratory in Kufa, the ruins of which were discovered two hundred years after his death. In 803, Jafar ibn Yahya was put to death and the Barmecides were banished after earning the disfavor of the Caliphate. Jabir fled to Kufa, where he is said to have lived long enough to persuade the succeeding Caliph, Al-Ma'mun, to nominate a successor of Jabir's choice. According to this tradition, Jabir would have died only after the naming of the successor, Ali al-Rida, in 917. The word gibberish is sometimes theorized to be derived from his name, though sources such as the Oxford English Dictionary suggest it stems from gibber: However, the first known recorded use of the term "gibberish" was before the first known recorded use of the word "gibber." Syed Nomanul Haq, Names, Natures and Things: The Alchemists Jabir ibn Hayyan and his Kitab al-Ahjar (Book of Stones), [Boston Studies in the Philosophy of Science p. 158] (Dordrecht: Kluwer Academic Publishers, 1994). Donald R. Hill, 'The Literature of Arabic Alchemy' in Religion: Learning and Science in the Abbasid Period, ed. by M.J.L. Young, J.D. Latham, and R.B. Serjeant (Cambridge University Press, 1990) pp. 328-341, esp. pp 333-5. William Newman, New Light on the Identity of Geber, Sudhoffs Archiv, 1985, Vol.69, pp. 76-90. Holmyard, Eric J. 1962. The Makers of Chemistry. London: Oxford University Press. History of "Jabir ibn Hayyan"
This page was last modified on 30 March 2014, at 22:35.